This forum consists of a listing of dive sites, including directions and other essential info. Plan your dive, dive your plan. It's a little pricey, but the food and service was pretty good. The above chart has changed from Admiralty Inlet to some place in New Jersey. The above chart has changed from Admiralty Inlet to some place in New Jersey. I typically use Northwest Shore Dives (Fischnaller) as a reference; Fischnaller references Admiralty Head, but NOAA appears to have discontinued use of that station. At this point, the closest current prediction station I can find from NOAA is Marrowstone Point, 1.65 mi NE of. If I apply Fischnaller's -31min SbF and +1min SbE to the prediction 1.65mi NE of Marrowstone, I get a prediction that roughly lines up with what planyourdive.com gives me for Keystone. The couple of times I've been to Keystone recently, planyourdive.com seemed to be fairly accurate, but I have been warned not to trust its predictions. For those of you familiar with Keystone, which current prediction station do you use, and what adjustments do you apply? Absolutely! Um, anybody care to loan me $700,000? 60south wrote: Nearby Facilities: Washrooms and a shower on site. A cafe across the street. The nearest dive shops are in Oak Harbor and Port Townsend. We did a "drift" from the pilings to the jetty yesterday. I put drift in quotes because the current was so light it was actually a swim. And it's a looong swim if you aren't being helped along. Also, the thick rope that leads from the pilings ends about 2/3 of the way. There is a large anchor (~45fsw) and then... pfft. No more rope. If you continue to follow a contour at, say 45ft, you'll eventually hit the jetty. Last edited by 60south on Tue Apr 24, 2018 4:20 pm, edited 1 time in total. 60south wrote: It's possible to drift from the warf to the jetty in a single dive, sometimes helped by a push from the current. In my experience, drifting from the wharf to the jetty is unavoidable. Even more fun off slack. Should probably put a note in that there's a thick line around 45ft FSW from the wharf to the jetty. Drops you off right at the middle of the jetty. No need to worry about if you will get blown past if you follow that. Directions: Driving from Seattle, take the Mukilteo Ferry to Whidbey Island. Drive 22 miles north on Highway 525, turn left to the Port Townsend Ferry and Fort Casey State Park, and drive 3.5 miles to Keystone. From Port Townsend, simply take the ferry to Whidbey Island and you're there. Staging Area: Good -- Parking is near the water, with picnic tables for staging. Nearby Facilities: Washrooms and a shower on site. The nearest dive shops are in Oak Harbor Anacortes and Port Townsend. Special Considerations: No underwater hunting or fishing in the conservation area. Maximum Depth: 60ft, although much of the life is shallower. Known Hazards: Strong currents are frequent here, and the ferry arrives on the other side of the jetty. Do not go 'around the corner' into the ferry lane! Dive Site Description: Dive along the east side of the spit and find a seemingly endless variety of life in the rocks. Wolf eels, octopus, nudibranchs, ling cod, rock fish, and many other species are commonly seen here. Be careful as you approach the end of the spit because the currents may be rippin', even during a supposed slack tide. Up the beach is an abandoned warf. It's shallower but also shelters an amazing array of critters. It's possible to drift from the warf to the jetty in a single dive, sometimes helped by a push from the current. There's a rope at ~45fsw that runs from the warf to the about the middle of the jetty, follow that. Keystone Jetty is indeed a crown jewel of Northwest diving. 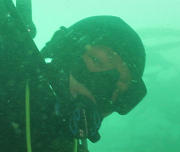 Check out Brandon Cole's excellent article in Alert Diver. Last edited by 60south on Thu Feb 07, 2019 7:29 am, edited 8 times in total.